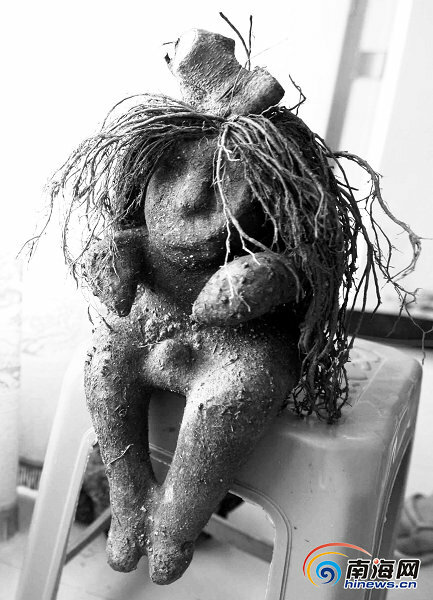 Mr. Zhu, a resident from Qionghai, Hainan province, bought a plant that looks like a man at the Beimen Market. He is searching for experts through the Southern Metropolis Daily to identify whether this plant has value or not. Mr. Zhu said that he bought the plant for 300 yuan from the Beimen Market a few days ago. The plant that looks like a man seems to be a root of a tree, and its shape is exactly like a man with long hair. Many people watching beside said that it has no man-made trace. If you have some further information, please call 13379882882.